This Situation Update describes events occurring in Mone Township, Nyaunglebin District between April and May 2016, and covers landmine incidents and threats to villagers. On April 26th 2016 Maung A--- was injured on his right leg by shrapnel from an exploded landmine and his buffalo was also injured when he was on his way to collect firewood. 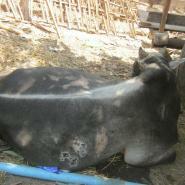 The landmine was probably planted by Company #1 from the Karen National Liberation Army (KNLA). Over 90 households of displaced people returned to live in B--- village. They were then threatened by Light Infantry Battalion #351 Battalion Commander Thet Naing Tun and Battalion Deputy Commander Wa Na to relocate again from the village on April 8th to 9th 2016. The following Situation Update was received by KHRG in May 2016. It was written by a community member in Nyaunglebin District who has been trained by KHRG to monitor human rights conditions. It is presented below translated exactly as originally written, save for minor edits for clarity and security. This report was received along with other information from Nyaunglebin District, including one interview, and 65 photographs. This Situation Update was documented from Moo [Mone] Township, Kler Lwee Htoo [Nyaunglebin] District on April 1st 2016 to May 1st 2016. 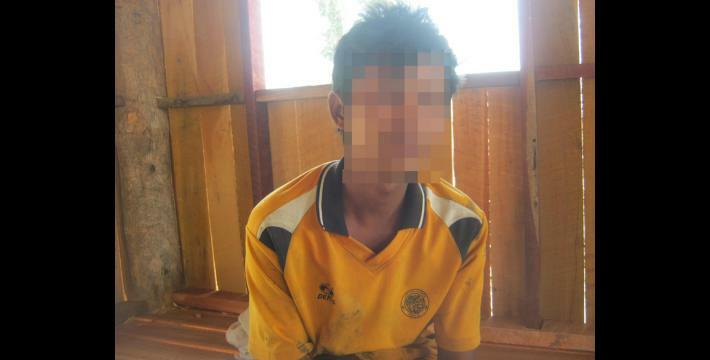 The Situation Update covers a landmine issue and threats to villagers. If we compare in the past years, the landmine cases are currently reducing in our areas but we cannot completely say there are no more landmines. Why? Because on May 10th 2016 I heard [that] the people were injured by the landmine. In order to receive accurate information I went to meet with a villager from C--- village and conducted an interview with a villager in the village. On April 26th 2016 Maung A---, who is a C--- villager, went to his farm to collect firewood. 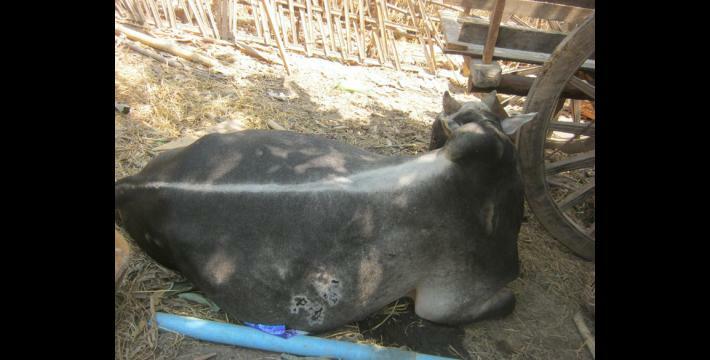 When he went by bullock cart on his way, the landmine exploded and injured his carriage, a cow and his right leg. Maung A--- did not feel happy with the incident but he could not do anything. He himself said that “I thought it is my land compound and I thought the people do not plant landmines beside my compound” I [KHRG community member] asked a follow up question about who planted the landmine and he told me that he did not want to say but he thought it might planted by the Karen National Liberation Army (KNLA) Company #1 soldiers. [He also added that] he knows all of them [soldiers] and has good relationships [with the soldiers]. After the incident they [the soldiers] went to visit him and they told him that “we [the soldiers] protected the forest and you were prohibited to go there. If you go it is your own [good or bad] luck”. [He said that] “if they come in the future I [Saw A---] will not provide drinking tea to them. The incident happened because people went to steal the logs from there so they planted the landmines, but for me, I did not steal the logs.” We can say that the landmines still exist and have not stopped [being used or been cleared] yet. At the present time, in the ceasefire period many people know the NCA [Nationwide Ceasefire Agreement] was signed and they also know that in the NCA both governments [Karen National Union and Burma/Myanmar government] have to attempt to take responsibilities for protecting and maintaining security for the civilians, but threats to villagers are still occurring in our area. On April 8th 2016 Bo Gyi [Captain] Thet Naing Tun and three of his soldiers under the control of LIB [Light Infantry Battalion] #351 came up to B--- old village which had been abandoned in the four cuts era. The villagers who left from that village came back to build their houses in the village. When Bo Gyi Thet Naing Tun came up he asked them to leave the village in the coming week [in the third week of April]. If they did not leave the village he [said that he] will go to burn down their houses or destroy the buildings by [mechanical] backhoes. In the same month, on April 9th 2016, Battalion Deputy Commander Wa Na and three of his soldiers from [Light Infantry Battalion] #351 came up along with Ler Doh [Kyaukkyi Township] administrator and repeated the same words [forced villagers to relocate]. The villagers had come back to build their houses and there are currently over [censored for security] households there. After they heard the information, some households [villagers] moved away from the village so only [censored for security] households were left behind [in the village] because they were afraid of threats by Burma/Myanmar military [Tatmadaw]. On April 12th 2016 Tin Hsan Oo, NLD [National League for Democracy] representative, came to meet with villagers and said that, ”You did not have to leave the village. I will be attempting to consult with the Tatmadaw”. The villagers who stayed behind in the village are waiting to see what will happen. They live with worry and fear but until now they [Tatmadaw] have not burnt down their houses yet. On May 21st 2016 five soldiers led by deputy battalion commander [from Battalion #351] came up to the village and said, “Whether you [the villagers] have to leave or not we are not going to say [threaten] anything. If some problems happen here you have to solve the issues by yourself”. Therefore we [KHRG community member] can say that the human rights abuses are still happening in our area. This Situation Update was documented from April 1st 2015 to May 1st 2016 in Moo Township, Kler Lwee Htoo District. Whilst the researcher reported the end date as May 1st, some incidents included in this Situation Update are dated up to May 21st 2016. In Burma/Myanmar, the scorched earth policy of 'pyat lay pyat', literally 'cut the four cuts', was a counter-insurgency strategy employed by the Tatmadaw as early as the 1950's, and officially adopted in the mid-1960's, aiming to destroy links between insurgents and sources of funding, supplies, intelligence, and recruits from local villages. See Martin Smith. Burma: Insurgency and the Politics of Ethnicity, New York: St. Martin's Press, 1999 pp. 258-262. Whilst the researcher reported the date as May 1st, some incidents included in this Situation Update are dated up to May 21st 2016.